If you've heard of a flax mill grinder, you might be wondering what it is and if such a thing is still used? You might also be wondering, why on earth you would want to grind flax seed. This article takes a look at the benefits of ground flax seed, and then discusses selecting a flax mill grinder. It is a rich source of Omega-3 fatty acids. You've likely heard a lot about Omega-3 fatty acids in recent years. That's because the modern diet has created an imbalance of Omega-6 (which comes from oils like corn and soybean oils) to Omega-3 fatty acids, leading to a decrease in overall health. Much of this decrease in health and increase in chronic disease is due to increased inflammation throughout the body, brought about partially by this Omega-6/Omega-3 imbalance. Increased intake of Omega-3 fatty acids through flax and fish oils fight the body's inflammatory response. Omega-3 fatty acids through flax seeds are especially important for vegetarians, who do not consume fish and therefore get much of their fatty intake in the form of Omega-6 oils. It is low in carbohydrates. For those who are trying to limit the effects of sugars and starches in the body, this is good news. Flax ground in a flax mill grinder can function in many recipes in much the same way that many grain flours do. It can also be added to protein shakes as a source of fiber. The nutritional payoff is higher with flax seeds than with starches and carbohydrates. It is high in fiber. It is commonly known that fiber is essential for good health. Ground flax seeds are a terrific source of beneficial dietary fiber. It is high in phytochemicals and antioxidants. Nutrient-rich phytochemicals and antioxidants fight free-radical oxidation in the cells, boost the body's immune system and promote cellular repair. Not bad for a teeny, tiny seed. The least expensive way to find flax is by purchasing the whole seeds. Pre-ground flax can be quite expensive. Another caveat in purchasing pre-ground flax is that flax is quite delicate and becomes rancid easily if stored incorrectly. Purchasing the seeds, keeping them in the refrigerator, and grinding them as you need them can extend the shelf-life of the flax seeds. Grinding flax seed is essential to releasing the chemicals, nutrients and fiber in the seeds. Because flax seeds are so tiny and hard, if they are not ground, they are likely to pass through the body whole. Each of the listed health benefits will not be released if the flax isn't ground first and made more accessible to the digestive tract. Whole seeds can be rough on the body - especially if you have irritable bowel syndrome or diverticulitis. There are several ways to grind flax seeds. Many companies market a flax seed grinder, which looks surprisingly like a coffee grinder. Here's a secret. It is a coffee grinder. It has just been rebranded and relabeled, and it usually comes with a higher price tag to match. Some are nearly double the price for the exact same piece of equipment. If you come across a flax grinder that looks like a coffee grinder, skip it and purchase a coffee grinder instead. This type of grinder is great for processing far more than coffee. It can be used to grind whole seed-type spices, as well. If you'd like to avoid flavor contamination, purchase separate grinders for spices, coffee and flax. Use your blender or food processor. Both of these common pieces of kitchen equipment will serve quite well in grinding flax seeds. For best results, pulse the blender or food processor several times until the seeds reach the desired consistency. Go low tech. It may take longer, but there are manual ways to grind flax seeds. 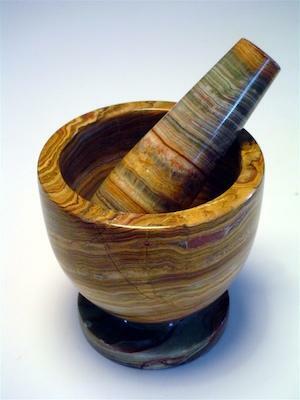 A kitchen mortar and pestle is one low-tech, inexpensive way of grinding the seeds. Manual spice mills work quite nicely, as well. These types of grinders work like a pepper mill. Many are specifically for grinding flax. Refrigerate flax and watch for rancidity by carefully observing expiration dates. Store flax seeds in a tightly sealed container. Only grind as much flax as you will need. Grind toasted seeds, not raw ones. With that simple advice, you're well on your way towards making flax a healthy part of your diet.